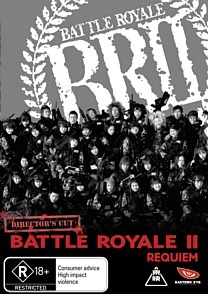 Battle Royale II: Requiem DVD Review. Worth watching, especially if you have seen the first. The best advice I can give is for you to not take it seriously and just have a bit of fun with it. As a fan of Eastern Cinema, in particular the titles that Madman release through their Eastern Eye imprint, I was exceptionally keen to get to review the second installment of the Battle Royale series. The first title was pretty intense for its time to be honest. A movie where kids kill each other in brutal, to the death combat made for some pretty bloody, and enthralling viewing. It truly was in it's own way, ahead of its time, bearing in mind of course that the first movie was made in 2000, and this one saw a 2003 release. Of course it makes sense getting this bad boy back out there on the shelves so close to and during the release of the blockbuster cinema hit The Hunger Games. Viewers who don't understand the lineage of the movies may incorrectly think that BR has copied the format of Hunger Games, but having been around so much longer, I would challenge people to accept them as their own entities as opposed to copies of each other. In this the second movie, Requiem, we see another group of unlikeable kids sent off to fight for the amusement of adults, but this time the stakes are lifted somewhat as they are sent to kill terrorists who are taking refuge on an island. Terrorists who are none other than the kids who survived the first Battle Royale. The story is utterly contrived as usual and lacks any true depth, which at times I did find annoying. The hokey over acting is back, but due to this being a sequel, I found myself less forgiving of it than I did the original. There is a plot twist during the movie that I am sure is meant to turn everything on it's head, and maybe in 2003 it did, but now it's more just a case of rolling with the punches as we see kids with explosive collars get blown up. The game itself has some new rules, and you dont have had to watch the first one to see this, but basically the kids are paired up now with collars that detonate if one of the kids is killed or goes too far from their partner. In other words, one dead equals two dead and formed one of the major flaws as far as I was concerned considering how badly the adults wanted these terrorists dead. Why would they kill another opportunity to carry out their agenda? I don't know. It just was a bit silly. Blood and guts are the order of the day with this movie and the R rating is possibly a bit extreme considering the amount of gore, the subject matter and the fact that you get to see kids shooting at kids. It's a light hearted bit of fun despite all this and in my opinion pretty easy viewing. I would have gone for an MA personally. The feature is well fleshed out with extra features that fill out the story a bit more and do provide for fans of the movies to get that bit more out of them. Worth watching, especially if you have seen the first. The best advice I can give is for you to not take it seriously and just have a bit of fun with it.